Royal Mail have marked today’s issue of their David Bowie stamps with a contest to win 52 sets postmarked with a special edition red handstamp (see image in montage). These first day covers have recently returned to earth after a trip into the stratosphere (OK, it’s not quite space), via the magic of the helium balloon. Fact fans may like to note that the flight reached 34,100m at a vertical speed of about 12mph. After the balloons burst, the stamps will have started to descend at nearly 200mph, slowing to approximately 8mph by the time they safely reached the ground again. FOOTNOTE: If you’re having trouble with today’s lyric quotation, it’s been tweaked from “I saw Sam falling”, a line from Scream Like A Baby. Fans of David Bowie can, from today, get their hands on the popular stamps issued by Royal Mail to honour one of the most influential music and cultural figures of all time. 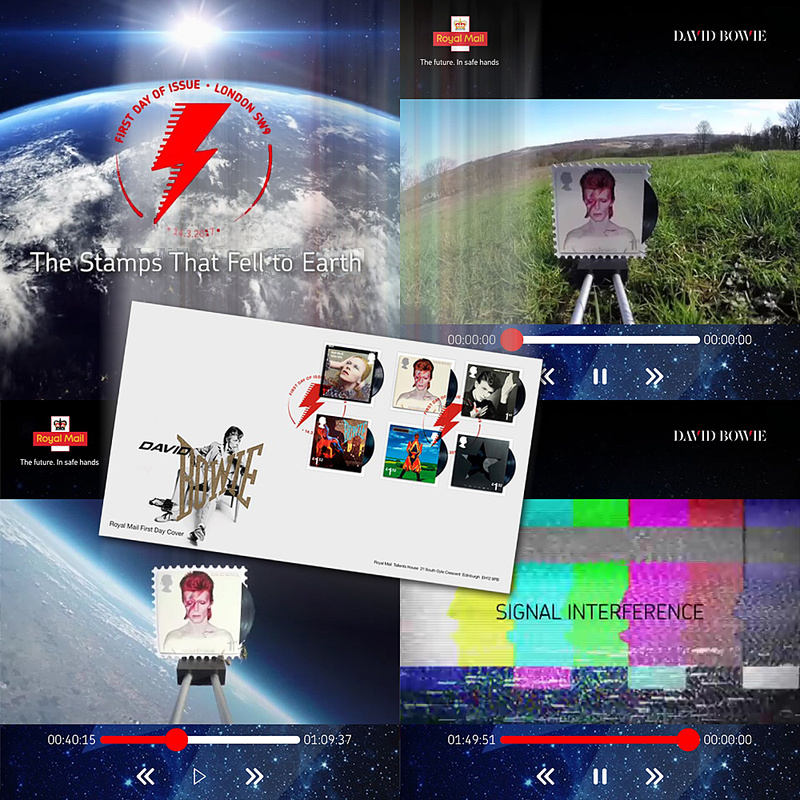 In homage to Bowie’s immortal role in Nicolas Roeg’s 1976 film The Man Who Fell To Earth, 52 First Day Covers, featuring a full set of album cover stamps, have been launched into space. Fans who correctly guess where ‘the stamps that fell to earth’ landed, can win one of the limited edition First Day Covers. The stamps have been postmarked with a special edition red handstamp of the iconic thunderbolt from the cover of Bowie’s Aladdin Sane. The 10-stamp set features six images from some of his most admired and defining album covers: Hunky Dory; Aladdin Sane; “Heroes”; Let’s Dance; Earthling and ★. The arc of the vinyl album protrudes from the right hand side of each stamp. The remaining four stamps show Bowie in action performing live on tours across four decades; The Ziggy Stardust Tour, 1973; The Stage Tour, 1978; The Serious Moonlight Tour, 1983; and A Reality Tour, 2004. The stamps and a range of limited edition souvenirs are available to buy from today here and from 7,000 Post Office branches across the UK and by calling 03457 641 641.